Banaz Mahmod was a recent UK victim of an "honour killing"
Specialist teams are to be set up around England to help deal with any so-called "honour crimes" and offences arising from forced marriages. Pilot projects are to be trialled in London, Lancashire, West Yorkshire and the West Midlands by the Crown Prosecution Service (CPS). Staff would be trained to enable them to deal better with witnesses who may be reluctant to give evidence. The scheme comes after several high profile "honour killings" in the UK. 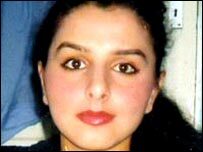 The most recent was that of Banaz Mahmod, 20, whose body was found in a suitcase buried in a Birmingham garden last year. Under the CPS scheme, each team will be trained by a number of different agencies including the police and the government's forced marriage unit. CPS Lancashire's Chief Crown Prosecutor, Robert Marshall, said: "Cases involving so called honour crime are often difficult to investigate and prosecute because they happen within a family setting. "Nonetheless, there has been a growing number of successful prosecutions around the country. "We recognise that this is a specialised area of work and are confident that the pilot will enable police and prosecutors to deal more effectively with these cases. "There is clearly no honour in committing very serious criminal offences in the misguided belief that they will protect a family's reputation."